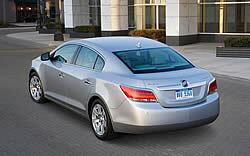 There are cars that are just basic and then there are cars like the new 2010 Buick LaCrosse. Since the LaCrosse was introduced to the Buick lineup replacing the long-running Buick LeSabre. It, it has generated a fresh appeal and overall new image that has reached out to consumers. Warm feelings arise when they step into the cockpit and know that the vehicle they are driving fosters appeal and luxury. It features state of the art technology combined with innovative design that sets a new standard. I was pleased with the amount of features that the LaCrosse had to offer. Even on the lower end LaCrosse, you will notice amenities that you would not expect. The design of the vehicle itself from the interior to the exterior puts on a façade that is bound to break the status quo. In general, this is a ground breaking achievement for the ageing company to reach beyond the norms and design a car that will appeal to a new generation of consumers who appreciate this kind of luxury. The test car for this review was the Buick LaCrosse CXL, which was well equipped with luxuries such as leather wrapped steering wheel, volume controls on the steering wheel, stitched dashboard, heated leather seats, and wood trim. As far as performance, the test car came with 255 horsepower. 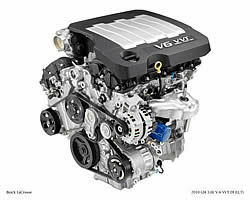 The 3.0 liter VVT engine is remarkably quiet even at higher engine speeds. With the adaptive shift control, more fun is introduced into the equation by allowing the consumer to shift gears like a manual transmission. The engine is so quiet you can’t even tell when the car is shifting gears. The LaCrosse CXL, clocked a 0-60 time of 8 seconds, which for a vehicle of this size, and amount of horsepower seems reasonable. If you want even more power, however, you could opt for the 280 horsepower, 3.6 liter V6, that adds more get up and go. Fuel economy is not the greatest, only averaging 17 MPG in the city and 26 MPG on the highway. All LaCrosses come with a 6-speed automatic transmission that seems fitting. Braking from high and low speeds was not a problem for the LaCrosse as it stopped within a respectable distance, which is thanks to the massive disc brakes with intelligent assist for both the front and rear. One downside to the quiet theme that Buick portrays for this overall quiet car, however, is the power steering. It was rather loud especially when turning the wheel. Aside from the noisy power steering, the rest of the ride was remarkably smooth. The front MacPherson suspension and rear struts also contributed to the smooth ride. The handling was good especially on turns that make you shift in your seat, adrenalin pumping through your veins as you take each corner. Even over the biggest potholes the car was extremely stable. Let’s talk about the interior, the most impressive aspect of the vehicle. It has a very modern design and that personifies luxury. Special things that make this vehicle quiet from the interior include a laminated windshield, front slide glass, triple door seals, and minute body panel tolerances to help keep the noise out. The wood paneling accents on the doors add a nice touch. On the steering wheel not only is there leather, but also wood grain, not to mention other convenience features such as a heated steering wheel. A power rear sunshade is one of the many unique features on this car. It provides protection to keep you more comfortable when the sun becomes annoying. The seats are heated and automatically adjust with the simple touch of a button. The interior comes equipped with dual automatic climate control that allows the passenger and the driver to individually control climate settings. Another nice feature is the audio system, which had an AM/FM/XM stereo with CD player and a digital audio input jack that allows you to play music from your iPod The available navigation system is also there to point you in the right direction if you get lost. The LaCrosse CXL came with a 7-speaker audio system. But if you want more enjoyment out of the audio system, then I would recommend the Harmon/Kardon with 384 watts of power and 11-speakers and 5.1 matrix surround sound, that speaks for itself. With its surround sound and amazing performance, it is everything you would expect on a high class luxury car. Other interior features include Bluetooth technology, which allows you to sync your mobile devise directly to the car. The voice is heard through the speakers in the vehicle. Push button start is also offered. The test car did not have the push button start, but it did offer a very nice key fob that allows you to do multiple things. The custom interior and ice blue ambient lighting is also a plus giving the consumers a welcoming feel. One interesting featured I thought was rather useful was the heads up display that tells you your speed. It is projected in front of you on the windshield in a place that it is not distracting. But, there is always the option of turning it on and off. The useful driver information center with compass and trip computer is there to keep you informed on how the vehicle is performing. For those long road trips, the optional in seat rear DVD system with dual screens, allows the rear passengers to enjoy the journey without complaints. Something that will give you peace of mind is OnStar, which includes turn-by-turn navigation, automatic crash notification, automatic notification of airbag deployment, stolen vehicle assistance and more. The LaCrosse also excels in exterior design. The curves are just as noticeable on the outside as they are on the inside. The headlights wrap around the side of the hood for appeal and the big grille with the Buick logo in the middle, adds even more appeal. The taillights are strategically placed, continuing the aerodynamic theme. The aerodynamic design is great because it allows the wind to have minimal impact, therefore, keeping the car from veering off in extremely windy conditions. The wheels on the test car were equipped with 18-inch machine faced alloy wheels. But the overall wheel options are 17, 18, and 19-inch wheels. It definitely looks like a car that means serious business. The CXL came with outside heated mirrors with LED turn signals that help other drivers see you when making turns. Other features include the halogen fog lamps and optional Xenon adaptive high-intensity discharge (HID) articulating projector lights, which turn as you turn. However, the headlights on the CXL test car were halogen. The LaCrosse CXL offers lots of important safety features that keep you confident. The StabiliTrak stability control system with traction control, keeps the vehicle in check, while the airbag system gives you even more reassurance. The air bag system comes equipped with dual stage frontal and side impact air bags, along with a passenger sensing devise that will turn the air bag off if it detects no passenger in the seat. The LaCrosse also has head and side curtain air bags for additional protection. Finally, the tire pressure monitoring system is equipped to alert you in the event that your tire pressure becomes low. The LaCrosse also received respectable crash test ratings by the government. In most instances the vehicle received 5-star crash ratings. The highest given for that category. That includes frontal impact crashes, and side impact crashes. The only place where the LaCrosse received lower than a 5-star rating was for the rollover test, which only netted them 4-stars. As far as comfort, the LaCrosse offers plenty of rear seat legroom, headroom, and knee room. The front seats were also very supportive giving the driver and passenger solid back and lumbar support. Storage is also a plus for the LaCrosse with lots of places to put things like in the storage compartment located between the front driver and passenger seat. The same cannot be said about the glove compartment as there was not much room for anything large. Most other automobiles that I have test driven tended to have much larger glove compartments, but the LaCrosse’s was mediocre at best. The trunk is a reasonable size, however cargo capacity might be reduced because of the noticeable bulges on both sides of the trunk.